Call the certified technicians at Linear Automotive when you need to find Mercedes Brake Pad replacement service in Plano, McKinney, Allen, or Richardson, Texas. We can service any worn or broken parts in your braking system. Our state of the art facility is only minutes away so come check out our Mercedes service in Plano and find out why more people are choosing Linear Automotive. Most braking symptoms usually show up with enough time to bring your Mercedes in for a repair. However, if you are experiencing braking problems don’t hesitate, just stop in at Linear Automotive and we will find out what’s wrong with the braking system and our certified ASE® techs will repair it. We’ll have you back on your way quickly with safe stopping capability. If you are here for the yearly maintenance interval inspection at Linear Automotive, we always check the suspension, tires, and do a wheel and brake inspection among the regular inspection list. The most common braking service is replacing the brake pads or brake shoes. Symptoms of worn brake pads include the typical squealing noise from the metal strip in the pads letting you know that it’s time to replace the pads. You may also get a dashboard warning light for your brake pads to be replaced. Other symptoms may include groaning, grinding, clunking sounds, which are past the warning squeal time frame. This is more serious and demands an inspection of the brakes as soon as possible. Extra grabbing sensations or pulling to the side may also be the brakes. The wheel should spin freely after you release the brake pedal. Sometimes a worn brake may continue to hold the auto by dragging the brakes as if the pedal is stuck down. Other symptoms may include a low pedal when braking, possibly attributed to low brake fluid in which the pedal may require more pressure to stop than before. The brake fluid may be low due to contamination or even have air bubbles in the fluid. The factory recommends that the brake fluid be replaced every 2 years and that the fluid lines are flushed clean. There are two types of basic brakes. In older vehicles there are the drum brakes usually in the rear, and the disc brakes on the front wheels. However, most cars today have disc brakes on all four wheels. The drum brakes are comprised of brake shoes, return springs, a brake cylinder, piston, an adjuster and an anchor pin. When these get worn they may need refinishing due to deep groves or scoring in the metal. These were sometimes used as front brakes too. 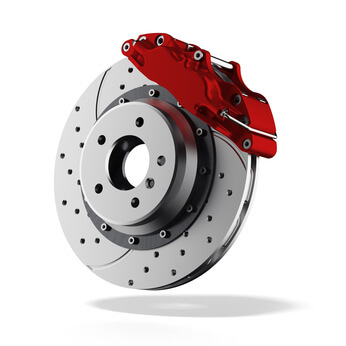 The disc brakes are usually used as the front brakes, but are now more commonly used on all four wheels. The parts of a disk brake include the brake line, caliper, disk, piston, and brake pads. There are several types of disc brakes, but the most common is the single-piston floating caliper. These calipers move side to side without springs. The brake pads always stay in contact with the rotor by just lightly touching. When the brake pads are being replaced, the rotors need to be inspected carefully. If there are any pits, grooves or scoring on the rotors, then they will need replacing too. With the rear disc brakes the hand brake may be incorporated in a rear drum brake in the center of the rear brake rotor or it can be integrated in the rear brake caliper. Today’s choices are numerous for brake pads. 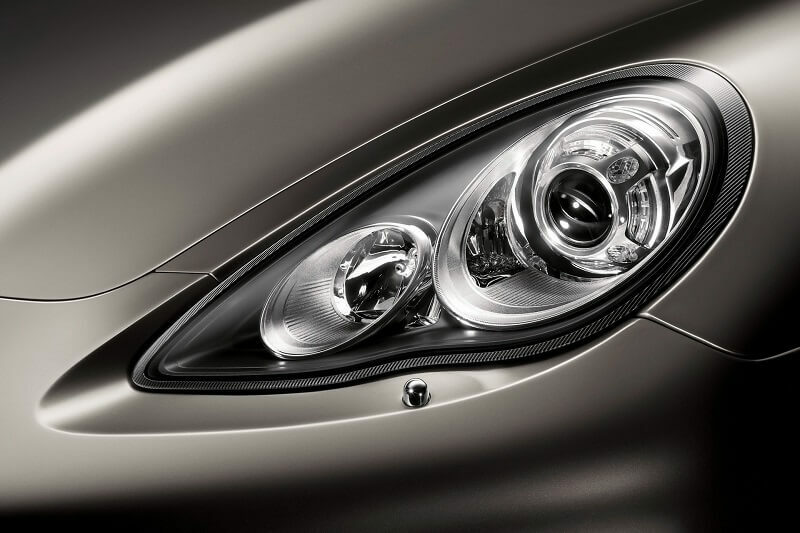 The basic two favorite top choices are the ceramic and semi-metallic. Most want a dust free, quiet and even braking experience without noises, or tugging sensations at all temperatures and various road conditions. 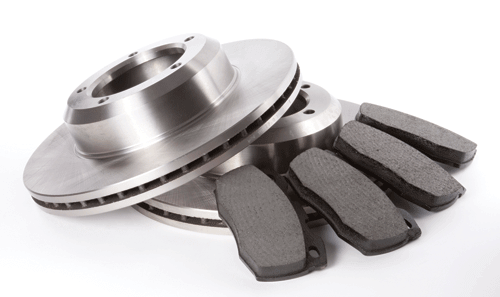 Brake pads have developed over the years by improving on the materials that are used. Originally, there were asbestos brake pads, then the organic brake pads and now with the development of new combinations of materials the semi-metallic types. They all had their good and bad properties of noise, stopping capability and wear attributes. As time went on the health hazards of the asbestos pads became known and they were removed from the market. The organic compounds were not completely reliable at all temperatures. The semi-metallic types have steel strands that are good stopping agents but these cause increased rotor wear and can be very noisy. The ceramic brake pads use a blend of copper fibers instead of the steel fibers. 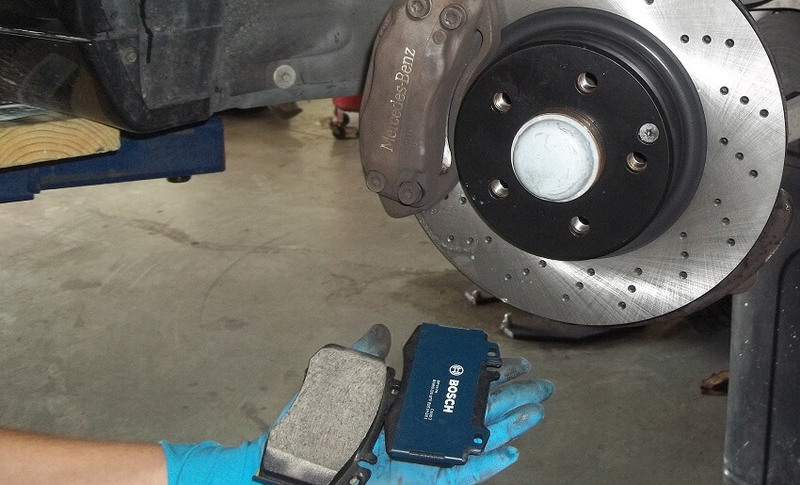 These brake pads offer less dust on the wheels, quick recovery after stopping, are quieter during braking, and can handle high brake temperatures. Ceramic brake pads are very durable, offer a good stopping distance and tend to be less noisy than other types of brake pads. If your brakes are giving you trouble or you notice a change, call Linear Automotive, certified brake specialists for Mercedes. We can repair your Mercedes brakes and braking system to premium condition. If your Mercedes brake pads need to be replaced give Linear Automotive a call and we will be glad to schedule an appointment. Our certified mechanics help people who need Mercedes Brake Pad Replacement in Plano, Richardson, Allen, McKinney, Frisco, The Colony, and all surrounding areas in North Texas. Most braking symptoms usually show up with enough time to take the auto in for a repair. However, if you are experiencing braking problems don’t hesitate, just stop in at Linear Automotive and we will find out what’s wrong with the braking system and our certified ASE® techs will repair it. We’ll have you back on your way quickly with safe stopping capability. If you are here for the yearly maintenance interval inspection at Linear Automotive, we always check the suspension, tires, and do a wheel and brake inspection among the regular inspection list. The drum brakes are comprised of brake shoes, return springs, a brake cylinder, piston, an adjuster and an anchor pin. When these get worn they may need refinishing due to deep groves or scoring in the metal. These were sometimes used as front brakes too. The disc brakes are usually used as the front brakes, but are now more commonly used on all four wheels. The parts of a disk brake include the brake line, caliper, disk, piston, and brake pads. There are several types of disc brakes, but the most common is the single-piston floating caliper. These calipers move side to side without springs. The brake pads always stay in contact with the rotor by just lightly touching. When the brake pads are being replaced, the rotors need to be inspected carefully. If there are any pits, grooves or scoring on the rotors, then they will need replacing too. With the rear disc brakes the hand brake may be incorporated in a rear drum brake in the center of the rear brake rotor or it can be integrated in the rear brake caliper. The semi-metallic types have steel strands that are good stopping agents but these cause increased rotor wear and can be very noisy. The ceramic brake pads use a blend of copper fibers instead of the steel fibers. These brake pads offer less dust on the wheels, quick recovery after stopping, are quieter during braking, and can handle high brake temperatures. 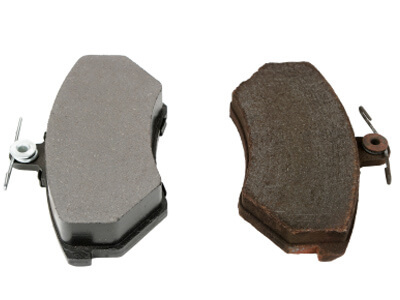 Ceramic brake pads are very durable, offer a good stopping distance and tend to be less noisy than other types of brake pads. If your brakes are giving you trouble or you notice a change, call Linear Automotive, certified brake specialists for Mercedes. We can repair your brakes and braking system to primo condition.